Comet Well seems to have 2 distinct conglomerate zones, Purdy's only has one. Purdy's gold is on the basement layer only. Comet Well does see some suspended gold. Concentrates from all samples yielded multiple flattened, “melon seed” nuggets attesting to the nuggety nature of the deposit (Please refer to Figure 4 in Novo’s news release dated December 21, 2017 for an image of such concentrate.). The richest gold grades appear to be concentrated near the base of the conglomerate package immediately above the dolerite footwall. Grades of 87.8, 46.1, 10.6 and 15.7 gpt Au were obtained from samples of this material from trench 1 and 17.7 gpt Au from a sample from trench 2. (Please refer to Novo’s news releases dated August 8 and December 21, 2017). Samples of footwall dolerite yielded significant gold, perhaps reflecting penetration of nuggets into this unit from above. Bulk samples of this material yielded grades of 4.1, 0.4 and 0.03 gpt Au from trench 1, and 2.2 and 2.7 gpt Au from trenches 2 and 3. Clearly, the underlying rock is prospective in areas immediately below the basal conglomerate. Conglomerate samples taken from areas above the base contain occasional nuggety gold. Grades of 1.3 and 0.2 gpt Au were obtained from two samples of this material from trench 1 and 1.3 gpt Au from a sample from trench 2. Novo views these results as indicative only since field observations indicate nuggets originate from upper conglomerates. Novo thinks samples of 5-15 tonnes will be necessary to better assess gold grades from these units. The Novo photos referred to in todays press release are located below the "Forward looking statements" paragraph. There is a new interview with Quinton on the KE Report where he discusses the most recent press release. If someone could link it that would be helpful. I found it interesting that Quinton believes that the lower conglomerate unit where the rounded boulders are at Comet Well is a new near shore marine horizon. He said this means it is not just a small alluvial channel. The marine land horizon can be large, sheet like and continue over a large area. 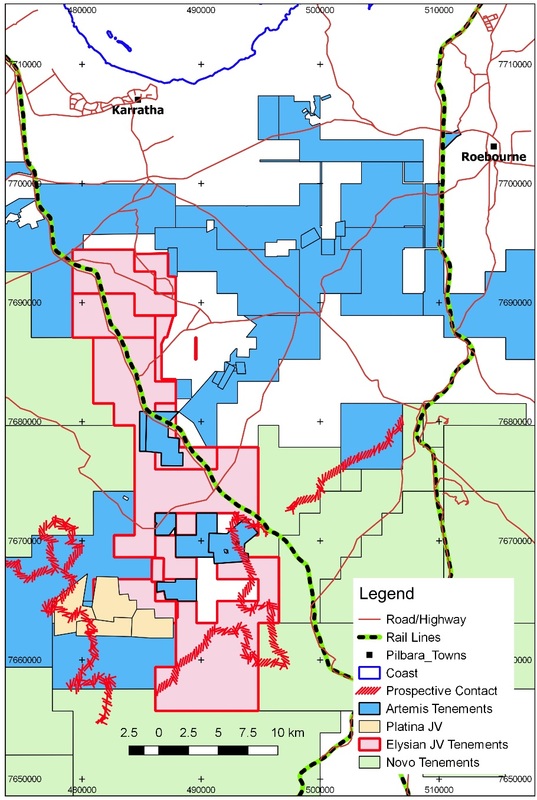 The Hedgeless Horseman does a great job summarizing the current geology/discovery status at Novo’s Comet Well and what it could mean for the greater Pilbara conglomerate play. This thing still has the potential to be huge, the find of a lifetime. Artemis Summary from HotCopper poster "millsking"
Great Summary from this poster on HotCopper. I went ahead and copied the full post below. Some of the Australian posters and news releases about the CSIRO partnership have stated that the 47 Patch is supposed to be similar in thickness and composition to Novo's Comet Well property (i.e. with both upper and lower conglomerate layers present). But that's still rumor at this point. Add to the gold discussion the Bloomberg news this morning that Apple is now securing/buying cobalt directly from the miners (See Artemis's Ruth Well & Carlow Castle properties below for cobalt resource data) and things are getting interesting on a whole lot of fronts for Artemis. Markedtofuture posted this announcement on the main site but figured I’d put it here as well for posterity. I reckon they are going straight for the Chinese mint. Good luck with that. List of the "Pilbara Sisters"
It appears that no grades will be discussed for another few weeks. On the other hand the picture #3 from the report shows a series of nuggets, approximately 80 from the bulk sample. It appears to me that there could well be 8 to 10 grams per ton in these nuggets alone. Obviously I have no clue about the actual weight from just a picture but I would be interested in the opinion of others on this matter. My guess is that the market place does not like waiting, but such is life. I don't see anything negative in the report at all. I agree that there was no per se bad news in the news release, however, the constant promise of results by a certain date and failure to meet those dates is disappointing. It is certainly disappointing to those people who purchased the stock in hopes of a quick pop by the end of April, and many of those people probably exited the stock this morning. The complete silence on the Purdy's bulk samples is also curious. Maybe they are not that good, maybe they are very good, maybe Novo has just moved on to Comet Well and will let Purdy's sit since they control that project. Maybe the grades at Comet Well are very good (my personal opinion) and there are discussions going on with potential miners and or joint venturers. The fact that this week Sprott Capital put money into Pacton Gold indicates to me that Eric Sprott is still a believer in the Pilbara and that there is a lot going on behind the scenes that we do not know about. Sprott is a deal maker and must be thinking about or discussing several deals. Certainly companies like De Grey and Kairos are possible takeover targets, but no one knows what is there and what the grade is. At least none of us. People on CEO speculated how much the nuggets weighted and were generally in your ballpark. Novo is an exploration company and will need to bring in someone else to do the mining. They have a lot of land to explore. Needless to say, ALWAYS scan any file you download from the internet for viruses BEFORE opening. I don’t want to have a bunch of Turdites angry at me because I pointed them to a .zip file with half a dozen Trojans and keyloggers on it. I can’t vouch for the source as it comes from the hotcopper messsage board. Slide 8 seems to be key - insinuating that this is indeed a witwatersrand analog. Yesterday it was announced that Northern Star Resources was purchasing the Pogo mine in Alaska from Sumitomo Mining and Metals for $260 million U.S. Pogo is a profitable underground mine in my home state. Northern Star should do well with this as they are excellent underground miners. Now my inference is that maybe Sumitomo is raising cash to prepare to do something on Beaton's Creek, on which, I believe, they they have an option with NOVO. If these dots can be connected then it would appear that NOVO may have more than one announcement in the near future about forthcoming development plans. Were NOVO and Sumitomo to advance BC, then additional funding could be available for NOVO's Pilbara operations. Any comments about this would be appreciated. Newest theory is that the gold in that area will be hosted in coarse gravel that can just be bulldozed up. Extreme low AISC.